It might have been wise to read the wikipedia entry before attending todays event .............. "They are also acclaimed for their elaborate live shows, which feature costumes, balloons, puppets, video projections, complex stage light configurations, giant hands, large amounts of confetti, and frontman Wayne Coyne's signature man-sized plastic bubble, in which he traverses the audience. 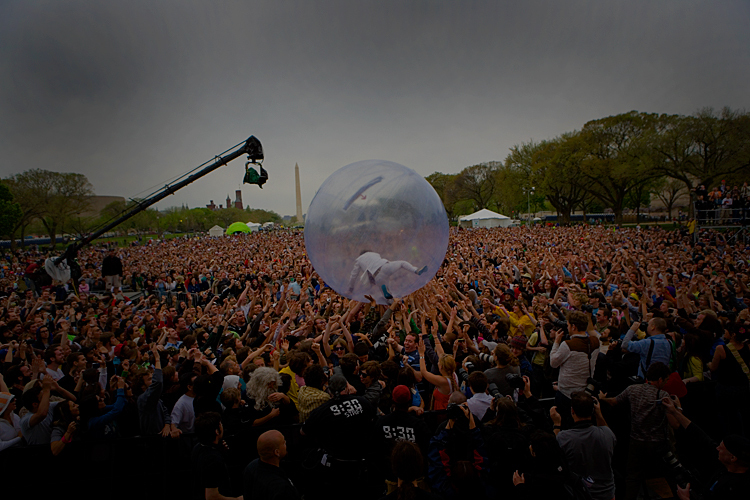 In 2002, Q magazine named The Flaming Lips one of the "50 Bands to See Before You Die". It was mega......... Wayne Coyne's signature one man bubble was a complete surprise to me........ see above........ it..... and the whole performance was just fantastic......... but when he suddenly popped in the bubble and was bouncing on the audience it was just such a fantastic piece of showmanship that made the whole show from the start! !